It began by following the American Association of Variable Star Observers (AAVSO) 10-Star Tutorial comprised of variables you can see through their entire range of magnitude with the naked eye under reasonable skies. If you’d like a go I’d recommend following the antics of Delta Cephei on every clear night with nothing more than a dim torch (nearly no equipment then) and a comparison chart like this one from the AAVSO tutorial. 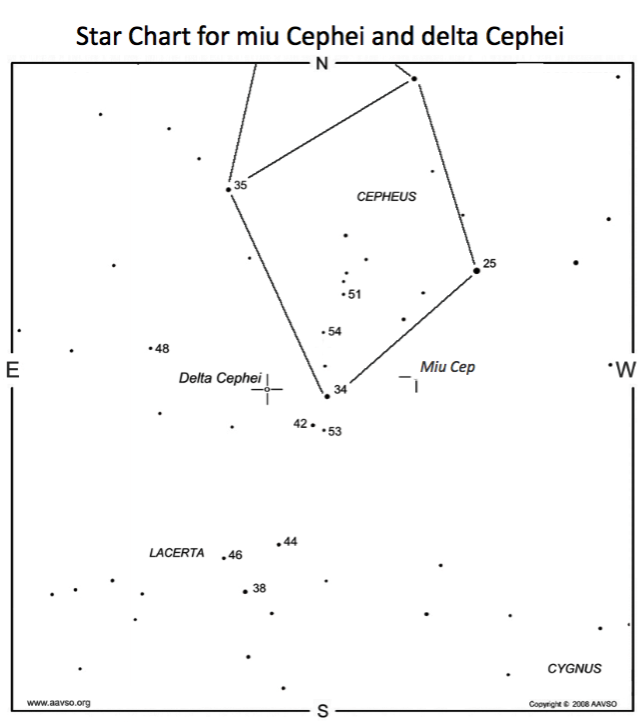 The star magnitude comparison chart for the two naked eye variable stars in Cepheus: Delta and Mu Cephei. Delta Cephei is a historically important star that helped us understand the truly staggering distances between objects in space. For the observer it has the distinction of being very active over a wide range of magnitude, all of which is visible to the naked eye. This comparison chart not only helps you find the star that’s the variable one, but it also provides several other stars with known magnitudes. You can see those with the numbers next to them. The number is the magnitude with the decimal point removed (they look too much like stars). So the star with 42 next to it is 4.2 magnitude. Let’s assume you’ve found the right part of the night sky. It’s possible, and acceptable to decide that delta Cephei is the same magnitude as one of the other stars. If that’s the case your work is done and you have your estimate. If it’s the same as star 42 for example, you write =42 in you notes. If it doesn’t match any of the comparison stars, it often won’t, you need to use the chart to look for a star that’s just brighter than delta Cephei. Make a note of its number. Next look for one just fainter and note that number down too. Then you need to decide which of the two comparison stars is closest in brightness to delta Cephei and call that difference 1. The tricky part is to decide how many times larger the magnitude difference is between delta Cephei and the other comparison star. An example might help. An excerpt from my variable star logbook with four observations of delta Cephei. 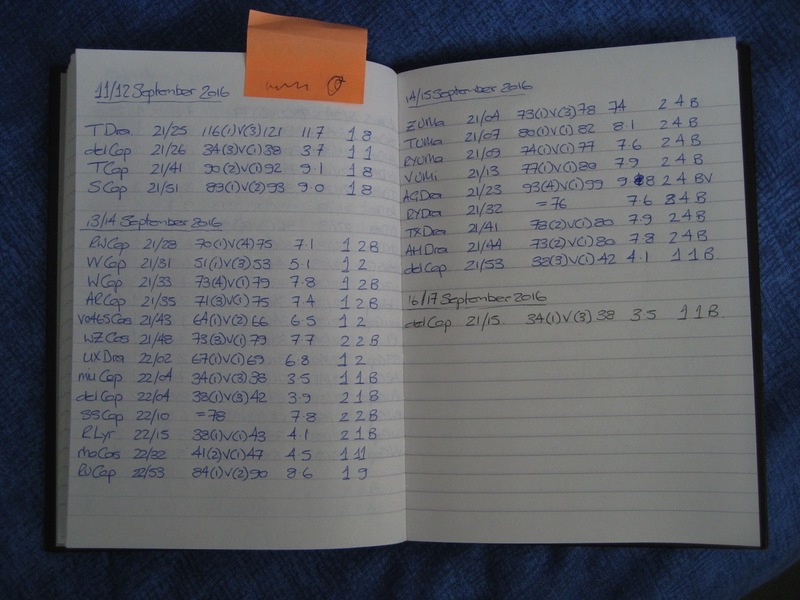 You can see that in my logbook above I have an observation of delta Cephei near the top of the left-hand page on the night of 11 September 2016 at 21:26 UT (always use Universal Time). I decided that delta Cephei was between stars 34 and 38, but closest to 38, and that it was 3 times fainter than star 34: 34(3)V(1)38. This worked out to a magnitude of 3.7 as follows: (38 – 34) / 4 = 1, so 38 – 1 = 37 which adding the decimal point is magnitude 3.7. You can see the results weren’t the same on every night. Once you have your estimate you might want to submit it to the AAVSO via their website so that researchers can use your data. You don’t need to be a member (I wasn’t at the beginning) just create an account and get busy. However submitting them isn’t essential, it’s fine to note them down for your own record and the enjoyment of tracking your chosen star. From the naked eye beginnings I moved on mostly binocular variables (those requiring binoculars and nothing more). The tool of choice was a Pentax 10×50 binocular which allows me to reach for magnitude 9 stars. I’ve since added some telescopic variables to my observing list which can be pursued down to magnitude 12.5 in my Skywatcher 130P newtonian. The process given in this article remains the same, and note that none of this is complex or expensive equipment. That’s the beauty of visual variable star observation and what drew me to it in the first place. With this basic kit I’ve made visual estimates of several different types of variable star including a Nova explosion and even a Supernova in another galaxy!